Refurbished Luxury 5 bed/5 bath villa with SOUTH facing pool. Our villa has recently received a full make-over. This included painting throughout, new bedding in all bedrooms, a 'Despicable Me' themed bedroom, an LG 55' 1080P LED TV wall-mounted in the livingroom and many more. We also upgraded to top-of-the-range stainless steel appliances. LOCATION, LOCATION, LOCATION – While Windsor Hills itself is perfectly located only 2 miles from Disney, our home is ideally situated within this 5 star resort. Just a short stroll to the clubhouse and across from the children's play area, this special villa will ensure you and your guests have a truly magical vacation. Relax in this expansive 5 bedroom/5 bathroom villa with a private south facing pool and raised spa. It has an extended deck area – perfect for those BBQ evenings. This luxury house at Windsor Hills has a bright and airy family living space, complete with plenty of over-stuffed reclining sofas, love seat, and foot stools, and an entertainment centre with HD cable TV and DVD player for those cosy nights in. ACCOMMODATION – This beautiful villa is large enough to sleep a party of 10! Sleeping accommodation consists of 3 king beds and 4 single beds. It has two master bedrooms, both include en suite bathrooms and large closet space. Every room has air conditioning and ceiling fans. All rooms are equipped with televisions with cable TV and DVD players. DINING – You will have a fully fitted kitchen complete with French Door fridge freezer, dishwasher and cooking range. Other equipment includes microwave, coffee maker and toaster. There are plenty cooking pans and utensils, crockery and glassware including plastic glassware for use around the pool area. There is a breakfast nook adjoining the kitchen as well as a breakfast bar with high stools. For more formal dining you also have a dining area off the living room. LAUNDRY – No need to worry about expensive trips to the launderette when you’re on vacation. The villa has a large capacity washing machine and dryer. Towels are also provided for your convenience. GAMES ROOM – The kids (and adults) will have hours of endless fun in this fully equipped games room. You will have a brand new full size 8ft slate pool table, an air hockey table and Foosball. There are also loads of books and board games. EVERYTHING INCLUDING THE KITCHEN SINK – We really have thought of everything. Your home away from home is packed full of everyday essentials. Some of these include Pack’n’Play, strollers, high chair, bed rails and stair gate, all supplied free of charge. Free local and long distance calls. You can also take advantage of FREE unlimited wireless internet; just bring your laptop or iPad. Windsor Hills Resort is located in Kissimmee, FL, just 2 miles -5 minutes from the entrance to Walt Disney World. Windsor Hills has all the amenities of a 5 star resort, so why would you want to spend your vacation in a cramped one room hotel when you can enjoy an incredible home, in an amazing resort, which is so close to Disney.The villa with its private south facing pool is located a short walk to all the amenities of the clubhouse and a stroll to the main children's play area. Why not visit Disney in the morning, return for lunch or a relaxing swim and return refreshed for the evening fireworks! The full size kitchen is fully equipped with cooking utensils. All linens, towels and pool towels are supplied. Pool, air hockey and fuseball tables in the games room for your enjoyment. Great house and location for a family trip! We loved our time together and were able to enjoy just relaxing by the pool. Allison T.Where do you live? We had an excellent time and the owner was very responsive! The kitchen and linens were well stocked and location was great and super clean! We would definitely stay again! The twin beds need a little updating. The king beds were perfect. Thank you for a great stay! It's hard to review a property without being biased by the wonderful memories! First of all, we love Windsor Hills and it just keeps getting better! There's almost no need to leave the premises once you settle in. Working with John was a pleasant experience and he promptly attended to all our needs and requests. The house was clean and comfortable and well stocked (especially after I left behind a few extra kitchen utensils.) My husband said the knives in the kitchen are dull and that usually means more dangerous! New knives or an inexpensive sharpener are needed. The one thing we have missed the last few years is a ping pong table. That has been one of our family's favorite activities at our houses. Other than that, it was a near-perfect vacation. Thank you so much. Oh, I forgot to mention that we enjoyed all our meals on the patio--adult table and kids table. Had a great time. Home is located in the perfect spot. This is our second time renting this home and will be back again next year. 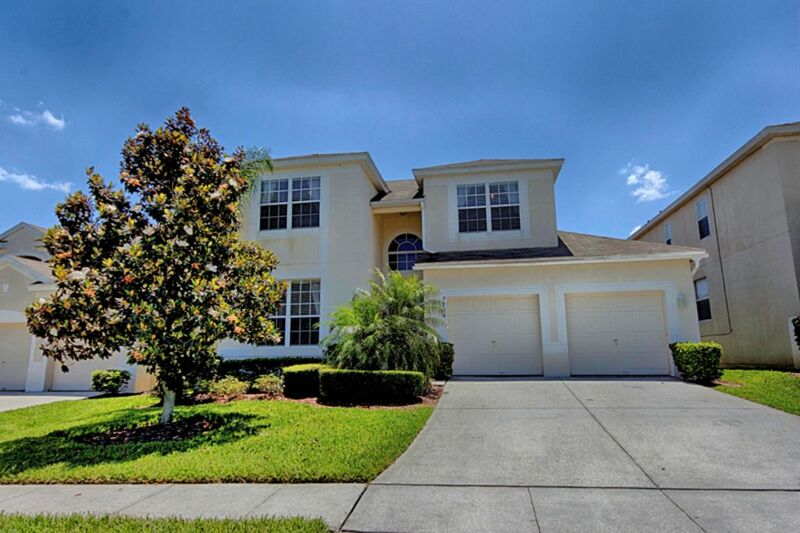 Takes you 12 min from the front door of the home to the parking lot of Magic Kingdom. The house was clean and had everything you needed for your vacation. We won’t stay anywhere else!!! The title says it all. Amazing house, perfect location to the clubhouse and it has all the amenities you will need! Thanks for letting us stay! Florida tax of 13% is included in rates. Pool heat is recommended Oct-Mar @ $20 a day Spa Heat only is available at $10 per day. Perfect for evening R&R all year round. Cleaning fee of $125 applies for stays less than 7 nights. It is advisable to ask for a quote as discounts by owner can apply at certain times, discount may also apply depending on length of stay.